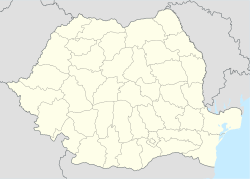 Cricău (Hungarian: Boroskrakkó; German: Krakau) is a commune located in Alba County, Romania. It has a population of 2,097 and is composed of three villages: Craiva (Királypataka), Cricău and Tibru (Tibor). The Dacian fortress on top of Piatra Craivii is believed by many archaeologists to be the location of Apulon. Apulon was an important Dacian political, economic and social center, the capital of the Apuli tribe. It was first mentioned by the Ancient Greek geographer Ptolemy in his Geographia, under the name Apulon. It is also depicted in the Tabula Peutingeriana as an important city named Apula, at the cross road of two main routes: one coming from Blandiana, the other from Acidava. The two roads merge at Apula, with the next stop on the route being Brucla. The Latin name of Apulum is derived from Apulon. ^ (in Romanian) "Cricău", at the Erdélyi Magyar Adatbank's Recensământ 2002; Retrieved on April 16, 2016. ^ The history of the city Retrieved 4 February 2012. This page was last edited on 28 July 2017, at 04:13 (UTC).